Lighting is a very important and often overlooked part of your marquee because it has a direct impact on the look and ambience of your event. We offer several lighting options: some where you can control the colour of light emitted and others which work really well when used in combination with other lighting effects. Most lights are controlled by a dimmer which enables you to set the correct light output for the time of day. Elegant and stylish, there's a reason why chandeliers are the most popular style of marquee lighting. We offer chandeliers in brass, silver, crystal and ivory. Controlled by dimmer. Beautiful and unique, we offer paper lanterns in many different sizes, shapes and colours. We can suspend anywhere from 5 to 200 lanterns from the ceiling of your marquee. Controlled by dimmer. Uplights are very effective when it starts getting dark because they create a warm ambience. They sit on the floor and shine light of any colour up the linings. Uplights complement overhead lighting such as chandeliers and lanterns very nicely. Controlled by dimmer. Spotlights are a contemporary option and work in several different ways. They can be used around the perimeter of the marquee to light areas such as bars or suspended in banks from the roof and angled to illuminate table centres. 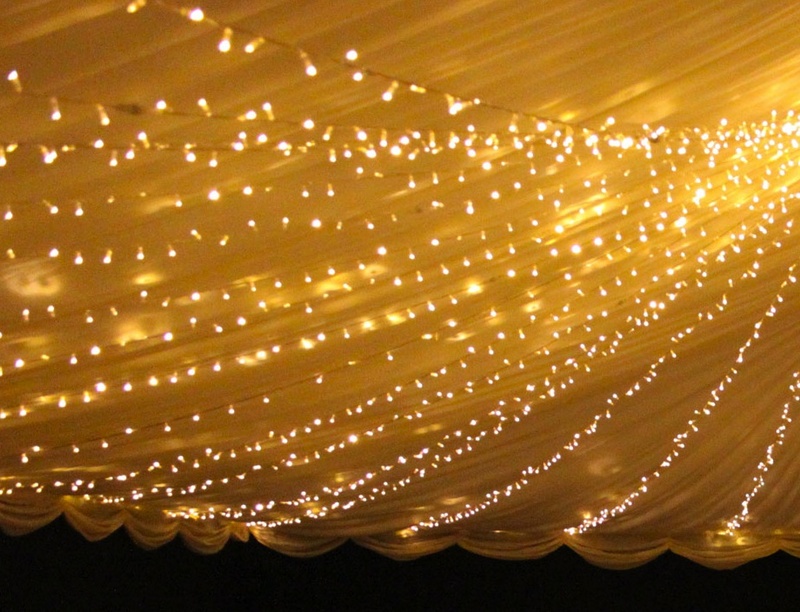 Fairy lights can be fixed anywhere: around the perimeter, a canopy over the dance floor, leading up to chandeliers and much more. They work well in combination with other styles of lighting, particularly uplights. Looking for something a little different? We stock two different styles of Moroccan lantern which are very effective in tipis, traditional marquees and chill-out areas. We also stock Moroccan furniture which you can see here. These are very trendy at the moment as Pinterest will tell you. They can be hired in groups of three or as a chandelier of twenty suspended from a cider barrel hoop - perfect around traditional marquee poles or at the top of tipis. Fitted with our retro filament bulbs or regular lightbulbs, these eye-catching and stylish pendants are very effective above bar counters, buffet tables or anywhere in the marquee you want to make a feature. 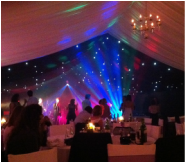 We can supply disco lighting effects, lasers, mirror balls and smoke machines for use over the dance floor plus more relaxed effects such as rippling water wave lights and gobo projectors for use in chill-out and reception areas. LED marquee lighting allows you to really make a statement. Any colour is possible and they can be programmed to change gradually and subtly alter the feel of your event. We stock a range of LED Par cans, uplights and bars. Festoon lights consist of a black cable with tennis ball size warm white light bulbs every 1m. They can be used inside or outside and look particularly good criss-crossing a traditional marquee interior. Outside lighting is often overlooked but it can be very effective. We offer spike lights, coloured LED floodlights, large HQI floodlights, LED multipars, fairy lights and festoon lights for you to set the scene. For a better sense of our lighting options in action, browse the many interior pictures in our Gallery.